This post contains affiliate links. This means that I will receive a small compensation if you purchase something after clicking through one of my links. The price does not change based on whether or not you use one of my affiliate links. Almost every time it's the whole family: me, Daddy, Catherine, and Dominic. However, it has been just me and the kids a more than a few times. Am I crazy? Well, maybe. But not for this. Since I've done it successfully so often I thought I would share some tips that have worked well for us. I know there are lots of scenarios out there that equate into only one parent being able to bring the kids, so maybe something in here will help you. Also, a lot of these Disney tips could apply to anyone, so even if you're just a kid at heart something here might help you! 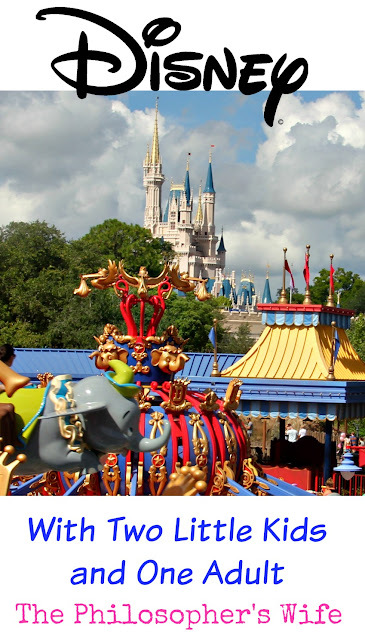 I recommend sticking with Magic Kingdom. As I write this, my kids are two and six. Catherine, 6, can ride everything Magic Kingdom has to offer. Dominic can ride a lot, but certainly not everything. The one big negative that Magic Kingdom has is getting over the lake. If you drive to Disney, which I do as a local, getting from the car to the front gate at the other parks takes ten minutes, tops, at Magic Kingdom it frequently takes a half an hour or more. If you're solo with the little people there's a good chance that you won't be able to do everything that you'd like. Space Mountain is one of my favorite rides at Magic Kingdom. I simply can't ride it though when it's just me and the kids. I've even had to give up an elusive Mine Train FastPass that I somehow scored because, clearly, Dominic can't wait for me by himself while Catherine and I ride. (That was a day we thought Daddy might be able to come.) I'm one of those people that could be at the park from opening to closing and be totally happy. My kids can't do that. Acknowledge that this might not be your ideal trip and then, well, let it go. 3. Watch carefully for tiredness. I think this is especially important whenever the children outnumber the adults. You only have so many arms! Maybe you have mastered baby (or toddler) wearing, pushing a stroller, carrying an umbrella, juggling three cups of water, AND not bumping into other people, but I haven't. Getting tired and cranky isn't good for anyone; sometimes cutting a visit short is the answer. When it's been just me and the kids we typically stay at the parks for about 4 to 6 hours. More than that gets dicey. I never go without a stroller. My Fitbit shows that I average about 7 miles a day in the parks. (Keep in mind, these are short park visits -- for a longer visit it's easily over 10 miles!) That's a lot for little legs. I've been looking for one of the sit and stand type strollers, but haven't found a good one in my price range. (Meaning I haven't found a good one at a yard sale or on Craigslist yet!) Catherine does a great job of keeping up, but I have had them both ride in the single stroller together more than once. Get those FastPasses! Lines for Winnie the Pooh, Buzz, and especially Peter Pan can be quite long. Also, ask the kids what they would like to do, their answers might surprise you. One time both of my kids wanted to spend time in Pooh's house. We hung out in front of the ride playing in Pooh's house for over half an hour. They loved it. 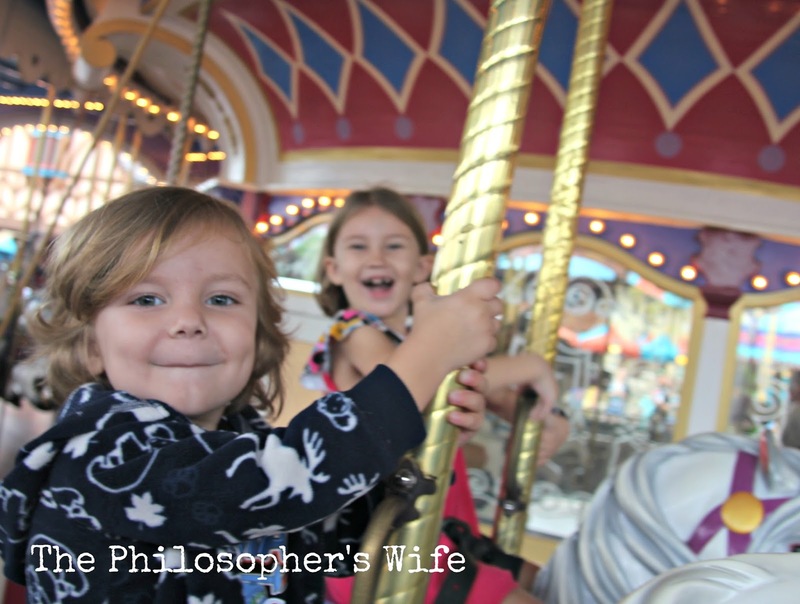 Another time Dominic wanted to ride the "horses" over and over again, so we rode the Carousel a half dozen times one morning. This is a good Disney World tip in general. My kids tend to be early rises, so getting there early isn't really an issue for us. While the initial opening of the gates surge can be intimidating if you've never been there before, it typically is the least crowded part of the day. Enjoy it! Seriously, you can get on about a dozen rides by lunchtime if you're there for the gate drop. We typically have three bags: small cooler, diaper bag, and a rain gear bag. The cooler (similar to this one) generally has PB&J and a few snacks (we don't pack water since it's free at all of the restaurants), the diaper bag has one day's worth of supplies, and then we have some type of rain protection for each person (especially during the rainy season). Try to keep each bag as minimal as possible. Whatever you bring you will be lugging around for the entire day. You will also probably be lugging your children at some point. I sometimes ditch the rain gear bag, although that has been a bad decision more than once, and sometimes we bring our pin trading bag (similar to this one, but ours is pink, with princesses). It's Disney. Enjoy yourself! 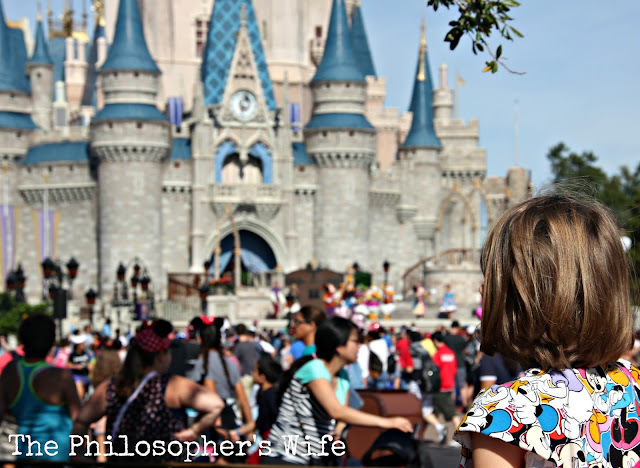 A Disney day, or week, will be different if you're the solo adult, but everyone can still have a great time! Do you have any great Disney tips to share? Let me hear them in the comments section! 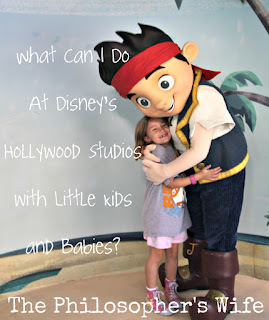 Be sure to take a look at what you can do with little kids and babies at each of the Disney World parks! 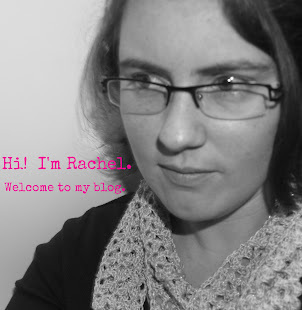 I will be sharing this post at various blog parties, including these. I love taking my kids to Disney with just me. It's different than a trip with my husband and the kids (which I also love), but there's something special about being there with just me and the kids. Great tips! I think getting there early is the best thing you can do, it really is the best time of the day to be there. I dont have kids but actually I think your tips are useful to everyone - especially around tiredness. 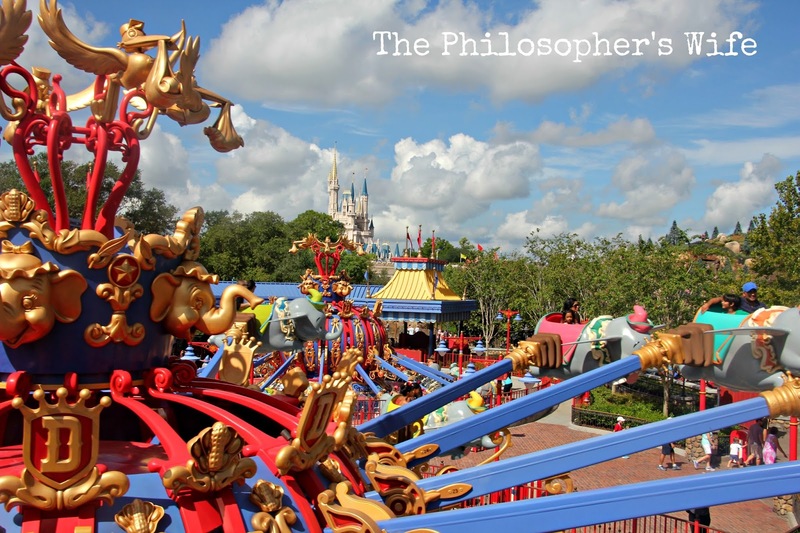 Too often at Disney World I see people trying to force themselves to have fun when they are just exhausted. Been to disney a few times, not the US main ones though. It's fun! Kids really like it there. Thoughtful ideas. These are great tips. I enjoy Disney during the off season personally. 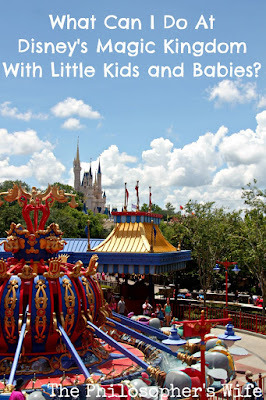 A stroller is a must because Disney is SO big! 4-6 hours of staying at the park is our limit as well. My nieces get too tired. 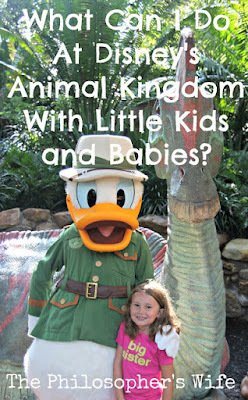 These are wonderful tips on visiting Disney, I think its so important to be prepared for anything might come at you. We're addicted too. Unfortunately, we reside in Michigan but we do try to go every two years for at least 7 days! 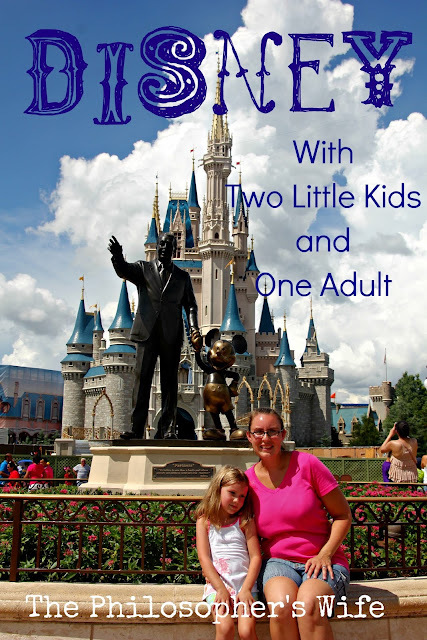 Magic Kingdom is by far our family's favorite out of all their parks! We love going there cause it's truly the happiest place on Earth! Really good tips. I personally would not want to do two kids by myself. These are some great tips! I find watching Disney trip videos to be really helpful to planning trips too. 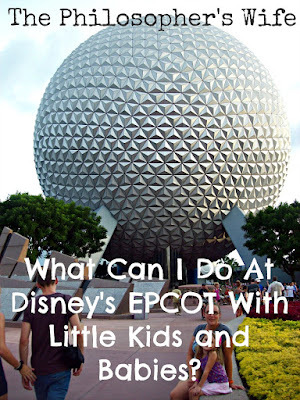 Taking little ones to Disney definitely sounds hard so thank you for these tips! Makes me miss Disney World so much! I haven't been in over 20 years (I was 13). So much fun. I do not have kids, but would love to go back soon. I always plan my outings to the tee, so Cute!